Looney Tunes is an animated cartoon series produced by Warner Bros. It was Warner Bros.' first animated cartoon series, preceding the Merrie Melodies series. The name of the series is a variation on Silly Symphonies, the name of Walt Disney's concurrent series of music-based cartoon shorts. From 1942 until 1969, Looney Tunes was the most popular series of cartoon shorts in theaters, even more popular than any Disney films. The first Looney Tunes cartoon short, Sinkin' in the Bathtub, was released in 1930. Since then, the series has become a worldwide franchise. It has been shown on television from the 1960s until the present day. There have been several TV series, full-length films, comic books, music albums, video games, and amusement park rides based on these shorts. 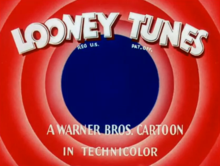 The Looney Tunes originally showcased Warner-owned musical compositions through the adventures of cartoon characters such as Bosko and Buddy. Later Looney Tunes shorts featured characters who have gone on to become some of the most well-known and popular cartoon characters in history, such as Bugs Bunny, Daffy Duck, Porky Pig, Elmer Fudd, Sylvester the Cat, Tweety Bird, Marvin the Martian, the Tasmanian Devil, Wile E. Coyote and Road Runner, Foghorn Leghorn, Yosemite Sam, Pepé Le Pew, Speedy Gonzales, and many others. Many of the characters have made cameo appearances in television shows, films and advertisements. ↑ "Field Guide To Titles And Credits". web.archive.org. Archived from the original on February 29, 2008. Retrieved August 16, 2015. This page was last changed on 16 April 2019, at 18:10.